A Korean seafood dish served in a clay pot. Korean cuisine is based on the principle of five elements: earth, metal, fire, water and wood. These elements are reflected in cooking methods -- wood fires, boiling water, clay and metal pots -- and in five types of seasonings --salty, bitter, hot, sweet and sour The Korean diet also is known for being particularly healthy, with its emphasis on grilled or broiled meats and seafood, vegetables and fermented foods such as kimchi. In Korean cooking, broiling or grilling are common methods for cooking meats. Perhaps the best-known grilled meat dish is bulgogi, made of sirloin strips marinated in a sauce made of soy sauce, sesame oil, wine, onions, ginger, garlic, sugar and black pepper. A 3-ounce serving of bulgogi typically contains 220 calories, 4.8 grams of carbohydrates, 29 grams of protein and 7.6 grams of fat, including 2.4 grams of saturated fat. Because Korea is surrounded by water on three sides, seafood is plentiful in the Korean diet. One type of seafood typically served in a stir fry or a stew is octopus. A 3-ounce serving of octopus typically contains 139 calories, 4 grams of carbs, 25 grams of protein and 2 grams of fat. A serving of grilled eel, another popular Korean dish, contains 201 calories, 20 grams of protein and 13 grams of fat, 3 of which are saturated. Grilled eel has no carbs. Korea, like many of its East Asian neighbors, favors a diet heavy in starches such as noodles and rice. 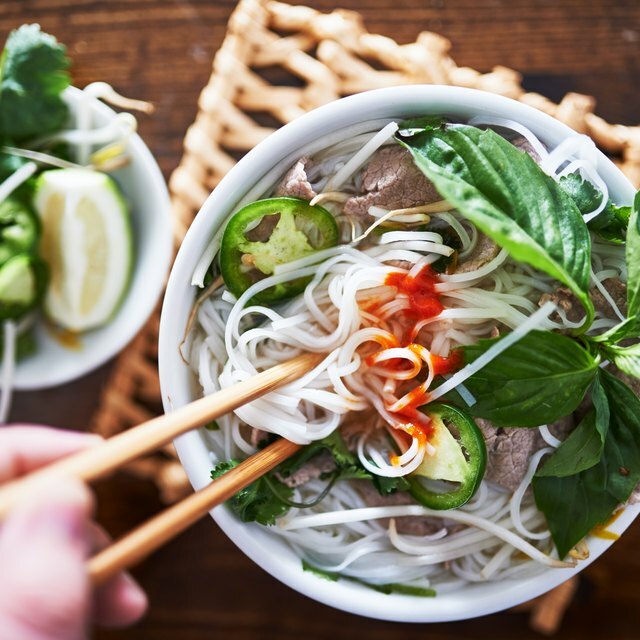 Noodle- and rice-based dishes tend to be low in fat, and although they are heavy in carbohydrates, the carbs are frequently complex because the noodles are often made with ingredients such as buckwheat and sweet potato. Korean instant noodles are not as healthy as fresh noodle dishes; they tend to be made from refined flour and contain added fat from the oils used for flavoring them. Koreans eat a lot of vegetables, either cultivated or wild-gathered. These vegetables include eggplant, which can be stir-fried or braised; bean sprouts, which can be boiled or eaten raw; fern shoots, which are typically dried, then rehydrated and stir-fried; and bellflower roots, which are usually peeled, shredded and pan-fried. Korean vegetables are usually seasoned with spices such as garlic, red pepper and ginger, all of which have both antibiotic and antimocrobial properties. Kimchi, perhaps Korea's best-known food, is also one of its healthiest. Kimchi typically includes fermented vegetables such as cabbage or radishes seasoned with red pepper; it might include other seasonings such as garlic, ginger or dried anchovies. Kimchi contains lots of vitamins A, B and C as well iron, potassium and calcium, and it is a good source of dietary fiber. The 1999 International Symposium on Vegetable Quality of Fresh and Fermented Vegetables praised kimchi for its health benefits, including antioxidant and anticarcinogenic properties. What Is the Ideal Braising Liquid for Steak?